See website for other accessibility maps in Brisbane…. As much of the data included as part of the City of Brisbane accessibility map has been obtained from other agencies, The OI Society of Australia cannot guarantee that information contained in the accessibility map is comprehensive and up to date. The information in the accessibility map is for informational purposes only and is not suitable for legal, engineering or survey purposes. If you have a disability and a lifelong need for ‘attendant care support’ in order to participate in community activities and attend venues, the Companion Card can help you with the costs of getting out and about with the support of a companion. Companion Card holders receive a second ‘companion’ ticket at no charge at participating venues and on public transport. The ‘companion’ ticket is also exempt from booking fees. 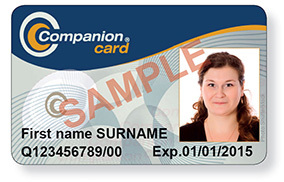 The Companion Card is issued in the name of the person who has a disability, and is valid for 5 years.